Flutterhy represents the element of Kindness. She cares for animals as a profession not caring much for flying. 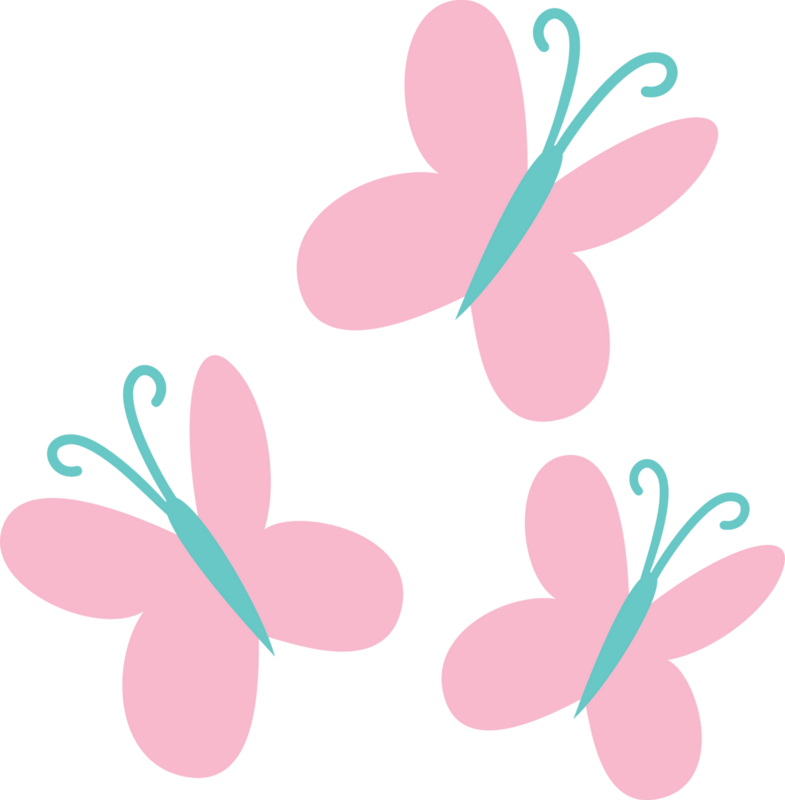 fluttershy's cutie mark is 3 butterflies. The wings are pink and the bodies are cyan. Despite being a Pegasus, Fluttershy does not usually help with the weather and does not use her wings as much as the other winged ponies. As shown in Dragonshy, she is also scared of heights, which is ironic in that Pegasi live in the clouds most of their lives. Because of this, she instead focuses on tending to animals' care. Fluttershy and Angel in Keep Calm and Flutter On. Fluttershy's special talent is communicating with animals, which she uses in order to provide them with food, medical attention and other forms of care when they need it. In addition, a host of animals have taken up residence in her home, which she attends to and looks after on an everyday basis. In Dragonshy, she delivers fish to a family of otters and gives worms to a family of birds to eat. In A Bird in the Hoof, she had just finished treating a mouse's broken leg before Angel reminded her of the luncheon for Princess Celestia, at which she discovers Celestia's "sick" bird, Philomena. Without the Princess's knowledge or permission, she takes the bird back to her cottage to try to recuperate it. However, her abilities prove to be ineffective in "healing" her; it is later revealed that Philomena is a phoenix and was simply nearing the end of her life cycle. In Lesson Zero, she appears to violently attack and injure a bear, but is actually giving it a rigorous massage to ease the tension in one of its shoulders. In Keep Calm and Flutter On, Fluttershy's communication talent is put to use when Applejack summons her to negotiate the removal of a dam with a family of beavers, who had caused flooding at Sweet Apple Acres by blocking a stream with said dam. The "Stare" in action. Fluttershy one, cockatrice zero. "The Stare" is the name given to a particular ability Fluttershy employs when dealing with misbehaving animals. This ability is powerful as it can 'control' chickens up to her own pet bunny, Angel. However, Fluttershy doesn't really like to use the Stare. Only when someone's life is in danger or to maintain order, the Stare is used. Rarity is the first to use this name in an episode, while asking Fluttershy's if she had used it on Opal to get her to behave during the cat's grooming session (she had not). Fluttershy is first seen using the Stare in Stare Master, employing it on her chickens to herd them back into the henhouse. When the Cutie Mark Crusaders notice that one of the chickens, Elizabeak, has escaped into the Everfree Forest, they disobey Fluttershy's orders to stay put and run off into the forest to search for the bird. When Fluttershy goes looking for the Crusaders, she comes across Twilight Sparkle petrified (turned to stone by a cockatrice) in the forest. She finds the Crusaders, but while she is trying to warn them of the danger they are in from the cockatrice, they are all ambushed by one, presumably the same one that petrified Twilight. It petrifies Elizabeak, then turns to Fluttershy and the Crusaders. Fluttershy, seeing the three fillies cowering behind her, becomes angry at it. She lectures the cockatrice, but when it won't back down, uses the Stare on it, ignoring the fact that as she must look it in the eye to do so, she is being turned to stone. The cockatrice finally relents (causing her own petrification to be reversed), and unpetrifies both Twilight Sparkle and Elizabeak at her command. She again uses The Stare at the end of Putting Your Hoof Down on Angel to make him eat his carrot salad. In Keep Calm and Flutter On, Fluttershy attempts to use The Stare on the newly freed Discord to make him behave. It proves to be ineffective against him, though he briefly feigns being affected by it to mock her. Fluttershy speaking up for her friends, and giving the dragon the lowdown on environmental pollution. Fluttershy is an average flier under normal circumstances, but is shown to be incapable of flight in moments of fear or stress; in Dragonshy, she is rendered paralyzed in midair upon hearing the dragon's snore at the bottom of the mountain, and is later shown to be incapable of crossing a chasm using her wings even after her anxiety had faded slightly. In the end, she casts aside her fear as she flies to her friends' rescue after Rainbow Dash launched a reckless assault that angered the dragon. In Feeling Pinkie Keen, she does not fly in order to escape the hydra, though she is seen flapping her wings while running and jumping. In the episode Wonderbolts Academy, after Twilight Sparkle's Twinkling Balloon that she and her friends are traveling in is destroyed, she does not remember that she can to fly to safety until Cloudchaser rescues her. Fluttershy sheepishly pulls herself out of her rescuer's grasp and hovers in mid-air, to Cloudchaser's annoyance. Fluttershy appears to possess only average physical strength at best, as she is barely able to carry Twilight Sparkle a short distance in Friendship is Magic, part 2, even with Rainbow Dash's help. She also attempts to carry Rainbow Dash to her cottage in May the Best Pet Win! after Rainbow Dash asks for a pet, but when she is unable to lift her friend off the ground, Rainbow uses her own wings to propel both of them further up. Fluttershy getting ready to be the best flier in ponyville for a day Despite her shortcomings with flying, Fluttershy has still performed some remarkable flying feats. She whizzes past Rainbow Dash in The Mysterious Mare Do Well while dressed in a Mare Do Well costume, catching her by surprise. She also catches up to a weighed down Rainbow Dash while pulling two ponies and the Twinkling Balloon in The Return of Harmony, part 2. In Hurricane Fluttershy, her "wingpower" is initially measured as 0.5 (her fellow Pegasi measuring above 5 initially), with an exhaustive training session raising it to a mere 2.3. However, when flying with her fellow Pegasi, she exerts herself enough to help them achieve the missing 5 wingpower necessary to create the hurricane that would carry the water to Cloudsdale. Rainbow Dash reminds her of what Rainbow considered to be a "wicked" nose dive to save a baby bird, implying that Fluttershy will perform whatever air acrobatics are necessary to protect her animal friends. Earlier in the episode she had a flashback from when she and Rainbow Dash were in Summer Flight Camp as fillies. Her fear of heights led to her pitfalls as a Pegasus, which led to the other Pegasus foals teasing her and chorusing the chant: "Fluttershy! Fluttershy! Fluttershy can hardly fly!" which is changed at the end of the episode to: "Fluttershy! Fluttershy! Fluttershy can really fly!" by the other Pegasi after they succeeded in bringing water up to Cloudsdale with her involvement in the task. 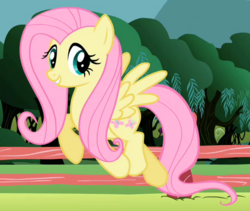 While she usually gets around by walking or running, Fluttershy tends to hover and fly when she is very happy, or in high spirits. Additionally, she also will gracefully twirl and do small flips if she is singing at the same time. When singing about meeting the animals as a filly in Sonic Rainboom, and speaking about her wish to see the animals in the private castle gardens during the Grand Galloping Gala in The Ticket Master, she goes airborne without seeming to notice that she did so. Helping Rainbow Dash chose a pet of her own also causes her to fly in her excitement, and when she and the others were invited to take part in Shining Armor and Princess Cadance's wedding in A Canterlot Wedding - Part 1, she flies around in the air with Rainbow as they encircle each other. "Fluttershy's freaky knowledge of sewing!" She is familiar with sewing, as Applejack describes as "freaky" in Suited For Success. She helps to finish the dress Rarity designed for herself with her friends in this episode. She dislikes a revised dress Rarity made her at first, and when pressed to explain what she doesn't like, points out uneven pleats, machine stitching, etc. Fluttershy is also seen reading a magazine in Green Isn't Your Color while waiting for Rarity at the spa, and while getting her hair done in The Best Night Ever. Also, for an unexplained reason, she keeps Twilight's, hers, and Pinkie Pie's gala dresses, including the dress Rarity had dared Applejack to wear in Look Before You Sleep in her wardrobe at the cottage as seen in A Bird in the Hoof. Fluttershy in A Canterlot Wedding When Fluttershy is first introduced in Friendship is Magic, part 1, she is conducting a rehearsal for a choir of birds for the Summer Sun Celebration. She has several musical numbers in the show: her rendition of the Evil Enchantress song, the Hush Now Lullaby, So Many Wonders, and Find A Pet Song which is a duet with Rainbow Dash. She idly hums the theme to the show in The Ticket Master and A Bird in the Hoof. She is also asked to provide the music for the wedding in A Canterlot Wedding. Fluttershy has a yellow coat, cerulean eyes and a pink mane and tail, and she speaks in a soft, gentle, timid voice. Her cutie mark is three butterflies. Fluttershy nervous about facing a dragon When Fluttershy is first introduced in the series, she barely manages to tell Twilight Sparkle her own name on account of her timidity, whispering so quietly that Twilight cannot hear her, and hiding her face behind her mane. However, she immediately becomes enthusiastic when she sees Spike, imploring the baby Dragon to hold a conversation with her, which he ends up doing, and follows him and Twilight all the way to the library. Her shy nature contrasts with Rainbow Dash's abrasiveness, most notably in Dragonshy, and to a lesser extent in Sonic Rainboom. In season one, Fluttershy's inability to speak up often annoys Rainbow Dash, and Rainbow expresses her aggravation more than once. One instance is when Fluttershy cheers as loudly as she can for Rainbow Dash at the beginning of Sonic Rainboom, yet much to the latter's exasperation, can't manage more than a whisper. Season two shows them having grown closer to each other as friends despite their differences. She fears dragons (with the stated exception of baby dragons such as Spike), and is hesitant to continue forward when she and the others embark on an expedition to deal with a sleeping dragon in Dragonshy, relying heavily on her friends' encouragement. In the end, Fluttershy finds the courage to speak to the dragon when it begins harassing her friends, going so far as to raise her voice in anger and stand on its nose to look it in the eye as she lectures it. In Stare Master, she tames a wild cockatrice in a similar manner, becoming angry with it when it scares the Cutie Mark Crusaders; however, in this instance, the Stare is employed. She is reduced to tears by Gilda in Griffon the Brush Off when the griffon roars in her face. Afraid to be in the same room as Gilda during Pinkie Pie's party, Fluttershy attempts to voice her discomfort to Pinkie, who obliviously waves off her distress. Fluttershy "enjoying" a nice hug from Princess Luna in Luna Eclipsed. In Luna Eclipsed, Fluttershy sequesters herself at home in her cottage during Nightmare Night, and refuses to answer the door until she learns that her visitor is Twilight. In Putting Your Hoof Down, Fluttershy becomes "assertive" after attending a seminar from Iron Will. However, when she over-asserts herself, (e.g. going berserk when a mail carrier delivers her the wrong mail), Rarity and Pinkie attempt to intervene. In the end, she realizes her mistake after driving her friends away in tears, and with the help of her animal friends, locks herself in her cottage to prevent herself from causing anyone more harm. When Iron Will visits shortly afterwards to collect the fee for his seminar, Fluttershy uncharacteristically politely refuses him, eliciting shock from the onlooking Rarity and Pinkie Pie. She explains that she is evoking Iron Will's earlier guarantee that if a customer was not satisfied with his services, they would pay nothing; as she is not satisfied, she will not pay him. Iron Will relents and leaves, and her friends congratulate her on her newfound confidence. In Dragon Quest, she again displays her fear of dragons. Fluttershy pointedly refuses to watch the Dragon Migration with her friends, despite Twilight's coaxing. It culminates in Fluttershy pushing past Rainbow Dash and jumping out the window, fleeing the scene before any of them could follow her. Fluttershy training to improve her wingpower for Tornado Duty. In Hurricane Fluttershy, she tries to evade her responsibilities as a Pegasus to help create a tornado to move water to Cloudsdale from Ponyville's reservoir. After some insistence from Rainbow Dash, she reveals that she is afraid of humiliating herself by performing badly as a flyer in front of all the other Pegasi. She becomes even more discouraged after the anemometer (wingpower gauging machine) gives her wingpower as only 0.5. Her animals motivation causes her to engage in a period of training and exercise, but her second attempt only puts her at 2.3, further diminishing her hopes for improvement. In the end, Twilight convinces her to help when the other Pegasi's wingpower proves not to be enough to create the tornado. With a sudden burst of determination, she manages to surpass all the other Pegasi in flying speed, completing the 800 wingpower minimum to create the tornado and resulting in the water successfully reaching Cloudsdale. When the ponies venture into the Everfree Forest, she is the only pony who does not engage in a fight with a Manticore when it attacks them, and relieves it of a thorn embedded into its front paw. She later reveals to Twilight that she did not notice the thorn, but she shows consideration to the fierce Manticore regardless. This kind act entitles her to being the wielder of the element of kindness, as well as reveals her faithful and considerate handling of all types of animals. It's always the quiet ones. After humbling the dragon in Dragonshy and making it cry, she immediately consoles it and advises it to look for a more suitable place to sleep. When the animals in the garden of Canterlot run away from her in The Best Night Ever, she snaps and becomes uncharacteristically enraged. In The Return of Harmony Part 1, she is the only pony who isn't easily affected by Discord's manipulation, prompting him to forcefully hypnotize her into her polar opposite (in her case, cruelty). In this state, she appears to take pleasure in causing others grief and distress, such as trampling the flowers in front of the library, dumping water on Twilight Sparkle and Spike and snatching the Elements of Harmony from Twilight. When Twilight Sparkle sets out to reverse Discord's effect on her friends using a "memory spell", Twilight and Applejack are forced to hogtie her and pin her to the floor, with Applejack standing on her tail to prevent her from flying away. Upon returning to normal, a horrified Fluttershy initially believes her corrupted state to be a "horrible dream". In Keep Calm and Flutter On, she is the only one of the main six who believes Discord can be redeemed. She shows him genuine kindness and friendship, eventually leading him to change his ways. If the animals don't like Fluttershy, you won't either. Despite being soft-spoken and extremely polite most of the time, Fluttershy has shown a more aggressive side on rare occasions. Most of the time, Fluttershy can withstand almost anything that'll make other ponies explode in anger. But even a shy Pegasus like Fluttershy has her own limits. Shown in The Best Night Ever, Fluttershy slowly becomes frustrated when the animals living in the Gala's gardens avoid her. Instead of continuing her kind and calm ways to earn the animal's trust, she decides to MAKE them love her by setting animal traps. Not in animal traps to kill, but trap them in a cage. Eventually, the shy Pegasus explodes, yelling and screaming, wanting the animals to love her, no matter what the cost. Fluttershy becomes angry when reminded that Discord will win if she is not able to catch Rainbow Dash in The Return of Harmony Part 2 (referring to Discord as a 'big dumb meanie'). This is one instance where Fluttershy doesn't explode in anger, but expresses her anger in words. In Putting Your Hoof Down, Fluttershy is too much of a 'doormat', where a pony can easily take advantage of the situation to their own benefit. For example, if a pony purposely cuts Fluttershy, she apologizes, saying that the pony can go first. Pinkie Pie and Rarity say that Fluttershy should stand up for herself so that she isn't pushed around. After receiving motivational advice from Iron Will, a manly minotaur that helps ponies like Fluttershy, she becomes progressively more violent and aggressive. Aggressive and violent to the point of reducing Pinkie Pie and Rarity to tears with her insults. However, she changes her ways by the end of the episode. Fluttershy lives in a cottage at the edge of the Everfree Forest and on the outskirts of Ponyville. It appears in several episodes, including Dragonshy, Swarm of the Century, and Stare Master, where it is one of the primary sets of the episode. The cottage's roof is covered in grass and is filled with runways, holes and perches for animals. In May the Best Pet Win!, Fluttershy is delighted to hear that Rainbow Dash desires a pet and takes her to her cottage's backyard, where she presents her friend with a great variety of animals to choose from. The episode The Cutie Mark Chronicles offers a glimpse into Fluttershy's past. Like Rainbow Dash, Fluttershy hails from Cloudsdale. As a filly, she was a weak flier, and was harassed by the same Pegasi who were jeering at Rainbow Dash in Sonic Rainboom, and they nicknamed her "Klutzershy". She was taller and ganglier than the other foals, with slightly larger wings. Rainbow Dash flew in to defend her, and challenged the bullies to a race that caused the participants to unintentionally knock Fluttershy off the clouds and fall to the ground, a place she had never been to or seen before. She was saved from a rough landing by falling onto a large swarm of butterflies. Upon seeing the animals and the greenery for the first time, Fluttershy becomes overwhelmed by the beauty of it all and starts singing. A few moments later, Rainbow Dash's sonic rainboom startles the animals and scares them into hiding. Fluttershy earns her cutie mark after interacting with the animals and realizing her ability to talk through to them, making her special connection with animals her sole purpose in life. Much is learned about the friendship between Fluttershy and Rarity during Green Isn't Your Color. She and Rarity seemingly meet regularly every week at Ponyville's day spa to converse and spend time together as something they have in common. It is noted that Rarity likes the full treatment while Fluttershy is more reserved, such as meekly declining a pony-pedi and having a mud mask applied lightly to her cheeks only while Rarity fully has the mask applied to her face along with cucumbers placed over her eyes. After getting the attention of Photo Finish with one of her hats, Rarity's desire to increase her fame as a fashion designer causes her to ask for Fluttershy's help as a model for her presentation, saying that her graceful personality would bolster her success at impressing Photo Finish. Hesitant at first, Fluttershy ultimately agrees to model for Rarity after plenty of begging on the latter's part. She is then entitled to becoming Photo Finish's next star to promote, and participates (rather unwillingly) in various photo shoots and fashion shows in the next few scenes. Throughout the episode, Fluttershy silently endures the attention she receives from her fans. Though unhappy with her stressful and disquieting status as Photo Finish's model, she willingly accepts her fate so as to grant Rarity's wishes for Fluttershy not to fail Photo Finish. She, however, is unaware of Rarity's growing jealousy towards her until the very end. Fluttershy with Angel, her pet bunny. Like any animal lover, Fluttershy has several animals that live with her or near her, though she never considers any of them as her "pets". Prominent among Fluttershy's pets is her bunny Angel. Introduced in the third episode, Angel is shown to have a bold and forceful personality in contrast to Fluttershy's soft-spoken and shy nature, often trying to motivate her to speak her mind and not let certain things dampen her spirits. Examples of this include A Bird in the Hoof, where he locks her out of the cottage to stop her from stalling by constantly returning to thank him, and The Ticket Master, where he insists on Fluttershy being more proactive in pursuing the extra ticket to the Grand Galloping Gala. However, in Putting Your Hoof Down, Angel is shown to be stubborn and temperamental when he refuses to eat a carrot salad she prepared for him and wants a more complicated recipe which Fluttershy refers to as his 'Special Recipe'. In addition to Angel, Fluttershy appears to have several more animals that she pals around with more often than not. Among these are a hummingbird named Hummingway, a pair of otters, a chicken named Elizabeak and a mouse called Mr Mousey. In the chapter book Twilight Sparkle and the Crystal Heart Spell, it's stated that she's gotten a new fruit bat called Toby. There are far more animals that accompany her at random times, such as squirrels, mice, bats, and even a bear on occasion, but most of these have not been given names yet. In Knights of Equestria she is traveling with the other Mane 6 to find a cute for Twilight's coma. Location : Flying high above Ponyville!